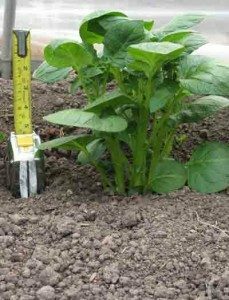 Traditionally potatoes (latin name – Solanum tuberosum) are grown in a ridge so that the new potatoes formed at the end of the underground stems do not become exposed to the light. If potatoes are in the light they turn green. Green potatoes are poisonous and must not be eaten. 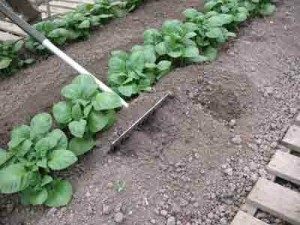 As the young potato plant grows and produces stems, soil is gently pulled towards the stems so that the soil forms a ridge either side of the stems. The best time to do this is when the stems are 6 or 8 inches high. As the stems elongate, the process is repeated using more soil. 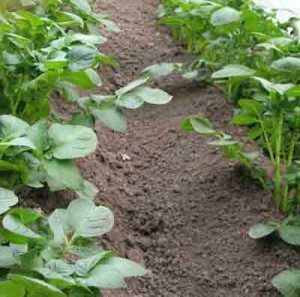 It is important not to disturb the soil around the roots because the tiny potatoes at the end of the stolons will be developing.